Yeahh!!! It’s Coachella weekend. The music and art festival is here, hot and fiery as always. So we can expect a lot of fringes, flirty rompers, crop tops, and general boho-chic style. I'm not a huge music or art fan, but I am a huge Coachella fan, well the Coachella style fan. Coachella was something I never knew about before, until 3 years ago one of my friend told me about it. Boy !!! post that I was glued to every update about it. This year, eagerly waiting for the looks. Last week while thinking about how its time for Coachella, I was like "Hey, I’m a blogger now !!! I can create a look as if I were going Coachella" and that’s how this happened. 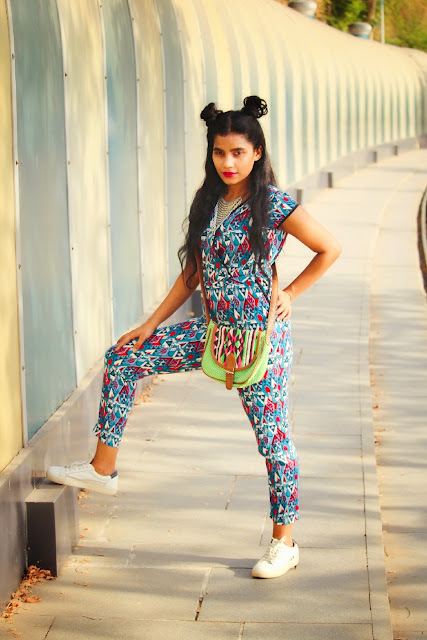 I chose a summer friendly fabric printed jumpsuit, the print on this felt so festival appropriate teamed with a neon green bag which is again equally festive.Well for the hair first I thought of braids, but later thought space bun’s would be more Coachella-ish. For makeup I went with a white eyeliner and pink lips. Do let me know if your are a coachella fan. Are y'all planning on going and even if your are not, what will be your look for coachella? Have a wonderful Coachella festival. The jumpsuit looks good on you. I love your look! Very cool! Your look is very nice and is perfect for use in summer days! cool print! and I love your hairstyle! Love the outfit and hair ! Che bel look!!! Mi piace molto anche la bag!! 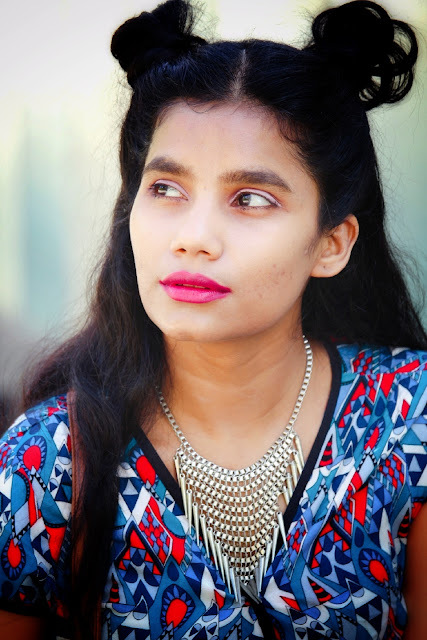 This is such a fun and pretty look! 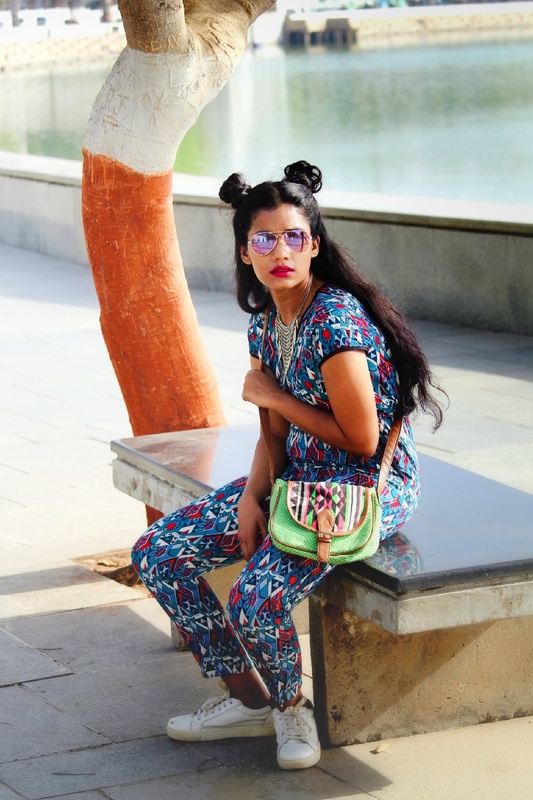 This is such a fun look, Priya!! I just adore how you styled your hair. Girl, you managed to pull out an amazing Coachella-like outfit! Loved your hairstyle! O look é bem divertido! You nailed this coachella look! Amazing look to go to Coachella. 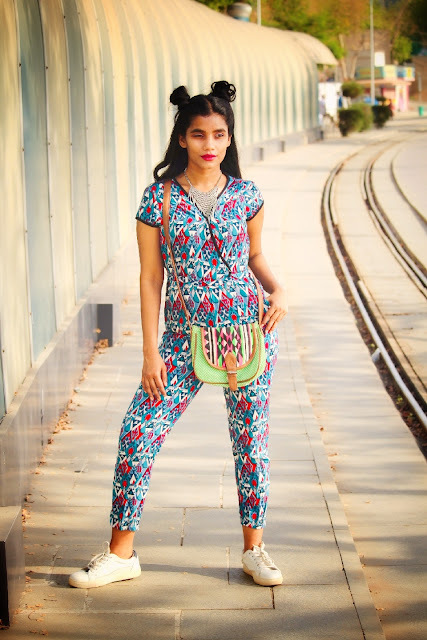 What a lovely jumpsuit! It would make for a great Coachella outfit. I love its print, so fun. Your hairdo is very cute. You look great! I've never been to Coachella, but it sounds like a fun festival. I love love love this outfit, and you haistyle is fabulous! Eu amei o macacão, é muito lindo! Wow, it's a great look! Perfect for a festival. Perfect festival look and I love your hairstyle too! This will definitely be a great Coachella outfit. Simple and comfortable! I love this outfit, super beautiful. Kisses! Great photos! I love your jumpsuit! Yes!! I love the boho! 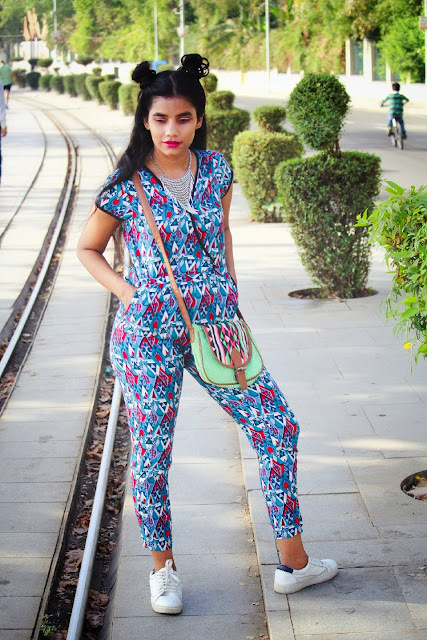 The print is so lively and fun, and that necklace is soooo gorgeous.